Perhaps this is covered somewhere...I checked the FAQ section but to no avail: What exactly is the relationship between this forum and the ISC? Why are we linked to their website? Just curious if there is some formal relationship. maybe the fund the gigg????? I only raise the question because I'd be interested in organizing a forum members sculpture exhibition and the ISC - assuming there is some connection - could be a good place to approach as a showing venue. The FAQ is just the VBulletin default FAQ for now. ...and he funds this forum out of his own pocket on his own server. Cheese Nice idea. How do we make it happen? Are we somehow connected to Grounds for Sculpture? "a forum members sculpture exhibition"
I like "Disparate Wanna Bees"
So who would be interested in a sculpture.net show? If enough here really want to do it maybe we could set up a page or thread for submissions and have the bulk of the show pre packaged to submit to????? I would offer next years block island show but that is a difficult travel destination and also only outdoors. It all depends on where you have it, as we all have to lug these sculptures there and back. I think that it would be great fun and I would love to meet the bunch of you in person. Could we try to hook on to the 2011 ISC Conference? or is that sacred. I am just thinking along this line in order to try and attract some buyers. So we can at least cover our costs. I showed at Lexington Art League it was a great show, really nice people and great fun. I didn't get any sales but there was a gallery connection that came up. In the end it didn't work out as that was Jan 2009 and the floor had fallen out of the market, but it was a great experience. Blake doesn't look like many responses. Maybe this was too buried, should we start a new thread? or is everyone here really just interested in typing and pontificating rather than making and showing? Theme? Simply the connection of the forum? Do we need to submit jpg's or will the curator invite? Yes Cheese did say he was interested in organizing a sculpture.net members show. Open to all to submit. Who will curate? Whoever cheese wants. Probably himself to keep it simple. Cheese do you want to be our show leader if there are enough here that want to show and to back you? 1 more title "Put up or shut up"
It would be best if such an exhibit was achieved at the greatest expense of every participant...ones most significant works put with others' same to ensure the quality and quantity of the ensuing pontifications. And no ants allowed. Sorry, this is not "business" - this is about something far more important...physio-intellectual advancement. The dust will settle afterwards, the vehicles will survive, the bank-accounts will recuperate and we here will have taken our blather to new heights - and be BETTER, every one of us, for it. I say we do it in Australia. I'll crate-up a thousand-pounder and send it right over...Underfoot, can we borrow your school's gymnasium for a week? Oh E. – you crack me up. I am happy to be a point person for a sculpture.net show although I would think Russ would have to sign off on it if we wanted to use the forum to organize and advertise the project. I was a gallery director for a few years before I took up teaching and I still enjoy that sort of thing. Off the top of my head I would think crafting the exhibition around a common theme might be a good start. For example, I once participated in and mounted a mid-Atlantic show called Mircomonumental. Each works (up to three per artist) had to respond to the notion of “monumentality” but also had to fit in a large matchbox. It traveled for a while and usually got a good response. Shoebox shows/projects are also popular. I don’t think we need to be as restrictive, but any show we craft as a community might be best served with this idea of a common theme. Also, I think managing expectations at the outset is important. This show would primarily be about making an aspect of this sculpture community tangible – and for fun. I would not think of this as an opportunity for sales – although I imagine any object list for the show would have contact info for each artist. Showing together is also likely to cost each artist a few bucks. I know participation fees is a often debated topic, but the reality of mounting and advertising a show would like require at least some contribution to show (if even to cover one's own shipping costs). I don’t think it needs to be “juried” as much as simply organized. Who is interested in something like this? Is there a critical mass that is needed to honestly represent the forum community. What theme embodies the spirit of the community here? 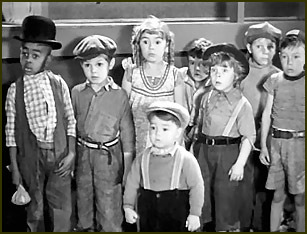 I think this nails it: The Little Rascals with a WTF expression. Theme: "The Real Me" (as opposed to the cyber-me that appears, ever in character, on these boards). eligibility: a forum history has already intoduced us to each other. Those participating folk. Opening reception (a must) and a possible cyber-link for those who cant make it (we have the technology...hell most phones can do it). That way Blake and Underfoot can get drunk and blather with us from thousands of miles away. Ants...okay, let them in. A proper forward can be written to clue them in. And it may be a thing of contemporary relevance that folks who have communicated passionately for years online eventually feel compelled to "REALize" the exchange (some scribbler might have a feild-day with that). Sales. Who cares (yes simple contact info). Now it's getting more interesting. Another theme idea partially borrowed from Joe and relating to above, "WTF", W standing for Who instead of What. "What" would be fine to, it embodies the positive spirit of many posts on the forum. How about opening reception for members only, closing reception for ants. We should do things differently. Although this may be different due to type of venue, specifically indoors, I don't do sculpture shows because most of my sculpture is one of a kind commissions, and if at any decent size I could not afford to have another copy cast in bronze for this purpose. Paintings, smaller to medium-sized bronzes, and bas -reliefs are what I could make available. None of those are the thing for an outdoor event, but indoor is possible. The idea is a good one, and jOe's Little Rascal's photo is a good one for the flyer. Funny, I thought Grommet had posted it until I looked again. Ries could jury it...he would let every entry in*, and it would keep him out of trouble for a week. *With the possible exception of mine as payback for the jibe! No jurying at all...too much pretense and self-importance there. For we all know too well "quality" is not truly identifiable (but the CONSIDERING of it is). Known participating members all. Managing and organizing...yes. I suppose some responsible individual like Cheese will do fine (I'll be in charge of libations). Glenn, I know damned well you've got an angel or two laying around the studio that will represent you just fine. And yes...indoors; lest we get overcome by pieces too large and hard to move around. This is fun-time, not go-time. And yes Rika. TWO partys. The ants love cheap wine and charming conversation. The ants love cheap wine and charming conversation. Wasn't it charming wine and cheap conversation? Hmmm, sounding pretty good so far. I have some venue connections at colleges that I will look into. Very possible that a show could have an inside AND outside component. Keep in mind the next open slot at any venue might be many months off - but you never know. If I can find something local (for me) then I will volunteer all the legwork of receiving and return shipping of art (as long as everything is pre-paid) and storing shipping containers during the show. Let me see what I can do. I think this is a subject worth debating. This might be the incentive for those lurkers out there to become more public. The forum is read by a lot of people – they may not be as participatory but should they too be offered the chance to show? I think the next step should be to secure a venue and a firm date. We can then see how much work we can accommodate and if the venue has any money to contribute. Then we could start a thread with the specs for submitting work (the logistics – not a jury) and as a place for answering questions, coordinating rides, and all that jazz.